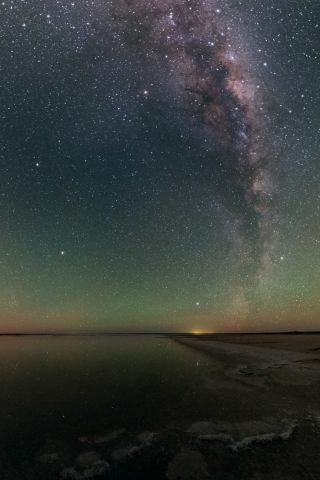 Arcturus (Marpeankurric – on the lower left) and the Milky Way over Lake Hart. This week, three bright planets continue to vie for our attention in the evening sky: Silvery Jupiter appears in the west-southwest, while orange-yellow Mars and yellow Saturn glow brightly, low in the southeast. Stargazers see the planets move across the sky throughout the year, but even the unmoving stars behind them aren't as steadfast as they appear. "Wandering stars" is a term usually applied to the planets. When ancient stargazers created the original constellations thousands of years ago, they called the stars that formed those constellations "fixed," because they appeared rooted in their relative positions to each other. But the planets were different, because they seemingly had the freedom to wander at will among the stars. Arcturus appears to shift its "fixed" position in the sky much more rapidly than most of the other bright stars (the sole exception is Alpha Centauri). Arcturus appears to whiz through space at a speed of some 90 miles per second in the direction of the constellation Virgo. From Earth, it appears to move toward Virgo by about 1 degree (which is about twice the apparent width of a full moon) over a time span of about 1,500 years. We are thus very fortunate to live at a time when the distance separating Arcturus and Earth's solar system is nearly at its minimum. It will continue to approach the Earth for several thousand years more, but then it will pass us as it continues to move toward Virgo, and its distance from us will then begin to steadily increase. Computations show that in approximately 500,000 years, it will probably have moved away from the Earth as far as 800 light-years and likely will have faded completely from naked-eye visibility. The curve of the Big Dipper’s handle leads to Arcturus, the brightest star in the kite-shaped constellation of Boötes. Surrounding Boötes is an amazing variety of double stars. Edmund Halley was the first to discover the star's motion back in 1718. Some believe, however, that Halley was not the first to notice the rapid motion of Arcturus.
" ... or canst thou guide Arcturus with his sons?" It was always George's contention that this Biblical quote did not refer to Arcturus' travels across the night sky, but rather to its proper motion, which during the millennia spanning ancient times was certainly great enough for careful observers to notice. "Alas," he noted, "Here is yet another mystery from those mists of antiquity." Although all the stars are moving rapidly helter-skelter through space at varying speeds that are measured in miles per second, their movements are not apparent to the human eye, even over a person's lifetime. However, if it were possible for someone to live for, say, 500 years, there would be some subtle differences. During the time of Columbus, for instance, the bright star Altair in Aquila, the Eagle — one of the three stars that make up the Summer Triangle — formed a much straighter line with its two dimmer flanking stars, Alshain and Tarazed. Alpha Centauri, which I mentioned earlier, is at present the sun's nearest stellar neighbor at just 4.3 light-years away. Over the next 28,000 years, its distance from Earth will decrease to just 3.1 light years, and it will shift noticeably northward, becoming visible — albeit low in the southern sky — for midnorthern latitudes. The star will be nearly twice as bright as it appears now. And by the year A.D. 50,000, it will cross into the northern half of the sky. Earth's current North Star, Polaris, remains in very nearly the same spot in the sky all year round, while the other stars circle around it. Only the apparent width of about 1.5 full moons separates Polaris from the pivot point directly north, around which the stars go daily — the spot in the sky to which the Earth's axis is pointing. But, as discussed earlier, the wobble of the Earth's axis (called precession) causes the celestial pole to shift as the centuries go by. Polaris is actually still drawing closer to the pole and, on March 24, 2100, it will be as close to it as it will ever come, just 27.15 arc-minutes (slightly less than the moon's apparent diameter). And different stars have become the North Star at different times. The brightest star in the bowl of the Little Dipper, Kochab, was the North Star at the time of Plato, around 400 B.C. In A. D. 10,000, the first-magnitude star Deneb in Cygnus, the Swan, will be near enough to the pole to be considered as the North Star, followed 4,000 years later by the brilliant blue-white star Vega in Lyra, the Lyre. The four points in the sky marking the start of the four seasons will shift as well over time. At the moment, for instance, summer begins with the sun shining in the constellation of Taurus and winter begins with the sun in Sagittarius. But 12,000 years from now, the situation will be reversed: summer will start with the sun in Sagittarius and winter will begin with the sun in Taurus. This doesn't mean that summer will begin in December and winter will begin in June — the start of each season will still occur in the same months that they do now. But what this does mean is that when Vega is Earth's North Star in A.D. 14,000, summer constellations that are currently low or invisible from midnorthern latitudes, such as Sagittarius, Scorpius and the Southern Cross, will rise high into the sky during December and January. And the bright stars that currently adorn the winter sky, Orion, Taurus and Gemini, will be very low or partly invisible during June and July. In fact, Sirius, the brightest star, will never rise above the horizon for northerners and will be observable only from the tropics and points south of the equator.